Battle scene of the Haitian Revolution - as imagined by a polish painter. 200 years ago, a great revolution took place. This revolution was the third in the great Golden Age of Revolutions, ideological heir to America's struggle for independence, and bolder still in its embrace of the Enlightenment values of equality and liberty. It is rarely discussed and not widely studied, yet its effects have been felt throughout the Western Hemisphere in the two centuries since it achieved its aims. Though it is convenient to apply the label "revolution," this revolution encompassed shades of struggle and combat that were not always meant to achieve the overthrow of the government. It was sometimes a rebellion, sometimes a civil war, sometimes a struggle for independence. Rather than a bold charge up a hill, this revolution was a switchback road up a steep mountainside. Unlike the case of the American Revolution, which was, more or less from beginning to end, "about independence," it simply is not easy to discuss this revolution in terms of what it was "about." It was about lots of things. The shape of the revolution, on the other hand, the chronology of events... that's easy enough to describe. This revolution took place in the French colony of Saint-Domingue, on the island of Hispaniola. Saint-Domingue was the wealthiest, most resource-rich, most valuable colony of its age... perhaps the most valuable colony of any age. If there had been such a thing at the time as a gambling house where you could place bets on the future of a country, you would have put your money on Saint-Domingue, certainly, not the relative upstart of America to the north. And, of course, you would have lost your shirt. In 1791, two years after the storming of the Bastille in France, a towering, fearsome vodou priest led Saint-Domingue's slaves in a revolt. Boukman's Rebellion spread, causing mass confusion and havoc in the colony. Boukman died early on, and of his successors it was the former slave and coach driver Toussaint Louverture who would come to dominate the military and political landscape of the colony. Under his leadership, the rebel army would become disciplined and organized, and would steadily gain ground against the French colonists. In 1793, Louis XVI was executed in France and this news landed in the colony like a blast of air in the middle of an ants' picnic, scattering soldiers every which way. Ties of loyalty were severed and sought to reattach themselves, a process which reorganized armies and redistributed materiel in novel combinations. In that year, the rebels joined Spain on promises of equality, a crown to fight for, and arms for the fight. But it was a French commissioner who, in a desperate (though sincere) gambit, would in fact grant freedom and rifles to 15,000 slaves in Saint-Domingue. In 1794, on realizing the hollowness of Spain's promises, the rebels rejoined France. Britain, which had made a play for the colony, was soundly defeated by Toussaint's troops. Toussaint's power and influence grew steadily, and he eventually assumed de facto control of the colony. After deftly maneuvering his rival Sonthonax and friend Laveaux out of the colony and back to France, the general undertook to transform a rebellious French holding into a prosperous quasi-independent state. With French attentions distracted by war with Britain and a quasi-war with America, Toussaint made treaties and trade agreements with both countries, proffered a Constitution, enforced work rules, and steadily increased Saint-Domingue's independence. It couldn't last. Napoléon Bonaparte, having settled French conflicts with America and Britain for the moment, turned his attention to Saint-Domingue. Seeking to restore the economic engine that had powered a third of the French economy before 1791 (and, some say, to establish a firm foothold on the North American continent), Napoléon sent his brother-in-law Leclerc with 25,000 troops to retake Saint-Domingue. Toussaint's once absolute authority over his army had slipped somewhat during the time of peace as separate interests within the colony came to the fore. André Rigaud had held power in the South for some years, and though he and Toussaint had once coexisted peacefully, France began to play the two against each other. Hesitation, disobedience, and defections within the officer corps weakened Toussaint until he had no choice but to surrender to Leclerc. Though given an opportunity to retire from the field, Toussaint was betrayed by his own former generals, deceitfully trapped, and deported along with his family to France. On April 7, 1803, Toussaint died in his cell at Fort de Joux in the French Alps. Toussaint's betrayal and the dawning realization that France was determined to re-enslave the blacks galvanized the rebels once again. 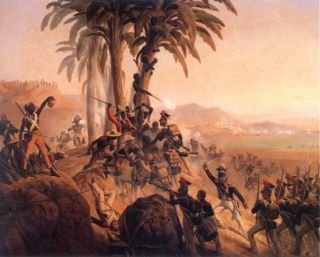 With Toussaint's former general Dessalines at command, the rebels defeated the French troops once and for all and declared the colony independent on January 1, 1804, taking the new name of Hayti from the original Taino/Arawak name for the island. Everything about Haiti's revolutionary history seems heightened somehow: the heroes, the villains, the violence, the triumphs, the tragedies, the depravities, the consequences, the repercussions. Reading through the work of historians of the period, it seems that something about the country inspires soaring rhetoric, lyric prose. Movies don't get made about the Haitian Revolution, but there are enough colorful characters, victorious underdogs and tragic heroes available in the historical record to make the careers of a phalanx of screenwriters. Great leaders sprang like weeds in the fertile fields of the revolutionary Saint-Domingue. Generals seem to appear from nowhere -- as from the brow of Saturn, fully formed and capable of brilliant military victories. Great leaders on the other side, capable, battle-tested men, geniuses of strategy... legends... are soundly defeated. Men die in gobs: 60,000 French soldiers, perhaps as many British. It is difficult to find official numbers of rebel dead, but certainly troops who were willing to throw themselves in front of cannon fire did not die in small numbers. Perhaps one reason the Haitian Revolution doesn't appear on the big screen is that it's impossible to pitch. There's no "high concept" ten-word description of the story. The revolution in Saint-Domingue was -- in part, only in part -- a fight to free the slaves of that colony. Africans had been brought, bought, and branded in droves to work the plantations, to make Saint-Domingue the impressive economic engine that it was; their urges to be free were bound to boil over eventually. But characterizing this revolution as being a racial struggle or being "about emancipation" is like looking at a black and white snapshot of a Seurat masterpiece: the characterization fails to capture the complex and subtle dynamics that were at play. Whites, blacks, and mulattos, rich, poor, powered and powerless fought on all sides at various times and for various reasons: to free the slaves, to restore the monarchy, to protect their position, to repel invaders, for independence, for liberty, for equality, for the status quo. As Bernard Bailyn so perfectly put it, this revolution was not a revolution at all. It was the unfolding of a process, whose deepest urge was emancipation. Caveat Lector: Understanding Haitian revolutionary history will make your heart break, will make you want to sing great wailing songs of despair and longing for what could have been. There are no clear victories or easy resolutions. Writer Matt Wood notes this effect and draws from the example of François_Mackandal, an escaped slave who orchestrated a simultaneous mass poisoning of white planters in 1757. On the eve of the morning that slaves across the colony were to have slipped poison into their masters' breakfasts, Mackandal was betrayed and captured. At his execution, flames licking his feet, Mackandal leapt from the stake. The assembled slaves raucously celebrated, for their hero had kept his promise to remain "in the Kingdom of This World." In their excitement, they apparently failed to notice that soldiers had recaptured Mackandal and thrown him back on the flames. As Wood says, "We know from history that this victory in the slaves’ eyes is actually a defeat, the loss of a fearless leader. Again this teaches a lesson: what is celebrated as a triumph is at the same time the beginning of another era of oppression." This is the essence of Haitian history. This page was last modified on 25 August 2007, at 20:33.